What is going on with Bernie’s Twitter?! Kamala Harris with only 2.5 million followers gets likes and retweets up to 50k, whereas Bernie with 9.2 million followers barely scratches 10k likes or retweets and only rarely 20k or 30?! What gives?! And, I do not think others employ bots to amplify their tweets. Please, help me understand this. It really makes me worried! On April 27 we are going to do something you will remember decades from now. "That is the day we are hosting Organizing Kickoff events in every state in the country, events which will lay the foundation for our grassroots campaign. And what I am asking you to do today is to say that you will host one of these events. Now, I understand that maybe many of you have never hosted an event like this before, but not only is it critically important, it is also quite easy. I know that you can do it, because tens of thousands of people did it successfully as part of our last campaign. And shortly after you add your name to say that you will, a member of our team will reach out to make sure you have any support you need along the way. This is the means by which we bring millions of Americans together to help transform our society. So what do you say? Please add your name to say you’re willing to host an Organizing Kickoff event on April 27. If we are organized, if we can bring millions of people into our movement, we’re going to win this election. So please, say you’re in. Maintaining a vibrant democracy based on the principles of justice has never been easy. And in these dangerous and unprecedented times, it may be more difficult than ever. 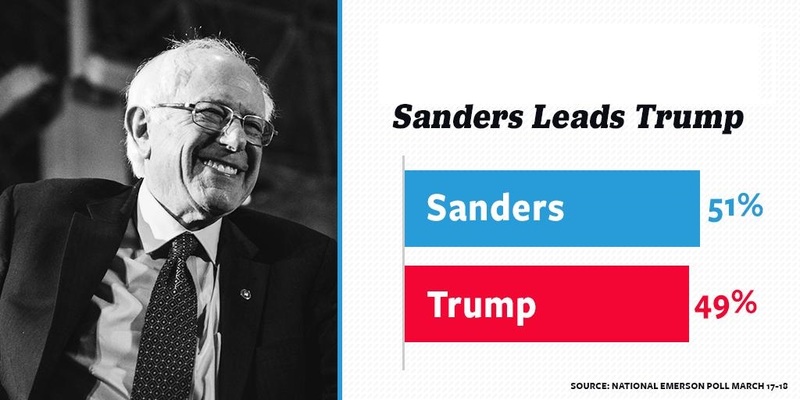 But we are going to defeat Donald Trump and transform this country not because I am a billionaire or because we have a super PAC funded by billionaires. We are going to win this election and transform this country because we will put together the strongest grassroots coalition in the history of American politics. I have said it before and I will say it again: real change always takes place from the bottom on up, not the top on down. That’s the kind of process I will always fight for — on this campaign and in the White House — because it is what I believe from the bottom of my heart. We start at the community level, then we go to the state level, and then the national level. And today I am asking you to be an integral part of that effort, because ultimately creating change starts with you. On April 27, we are going to bring people together from all across this country to take the next step in building an unprecedented grassroots movement from coast to coast. A movement which has the courage to take on the powerful special interests that dominate the economic and political life of our country. Thank you for saying you will take a leadership role in that struggle." Hey guys I think we need to modify Rule 3 especially with what has been going on in the last few days regarding Lucy Flores. I hope this doesn’t break the rules but ever since Lucy Flores has come out in public regarding inappropriate behavioral with Joe Biden I am starting to see media types flipping the blame as being a plant sent by Bernie Sanders and this. In fact it’s not just limited to him it’s happening to Our Revolution where if you read the replies they’re overwhelmingly disingenuous blaming the organization for conspiring a ‘hit job.’ This is really problematic and it is something that we all need to talk about whether in a thread or discussion since this is something that will damage our movement. I understand having this subreddit only focus on progressive issues and policies but I think this is becoming really concerning. Are you going to the Bernie Rally in San Francisco today? DONT GO ALONE! Bring as many friends and family as you can with you! Worried about there not being space? DONT. There is space for over 30,000 in the San Francisco rally park. Worried if it’s going to rain? DONT. There is no rain in the forecast for San Francisco today. Worried you might be too late? DONT. Bernie usually starts speaking half an hour after the rally officially starts. The doors remain open. If you have any medical conditions that prevent you from standing, there is designated seating available at the front. Simply go to the front of the line when you arrive and staff will guide you to the seating area – no wait required. Taking your friends or family to the Bernie Rally is the best way to convince them that Bernie’s got what it takes to be the next President of the United States. Many of my on-the-fence friends who were unsure about Bernie have been convinced to jump on the Bernie train once they attended their first rally. DONT GO ALONE! BRING SOMEONE OR MANY MORE WITH YOU! So you’re going to a Bernie Rally?